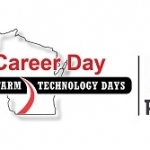 On Tuesday, July 23 Wisconsin Farm Technology Days (WFTD) will host it’s first-ever Ag Career Day. To participate in Ag Career Day, students grade 7-12 must register online or with their FFA or SkillsUSA Chapter. The trips will be FFA Chapter sponsored events and be provided free transportation, a free Ag Career Day t-shirt and free admission to the show. Students will need to bring cash to purchase food and beverages. For more information, contact Peter Curran at 608.658.4452 or peter.curran@plantpioneer.com.